This is one of the coolest things we’ve seen in a long time. 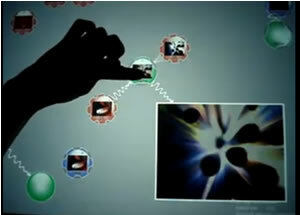 A small group of researcher at Microsoft’s UK Cambridge lab, including Stuart Taylor, have used the multi-touch Surface to bring an interface to VJing allowing anyone to get involved with the process. 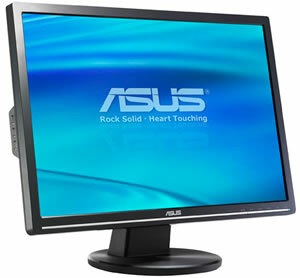 Asus has today released the first-ever DisplayLink certified monitor. 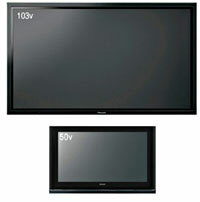 The 22-inch monitor, VW223B, uses the DisplayLink DL-160 chipset to connect to computers using USB2.0 and has a native 1680×1050 wide-screen resolution and a 3000:1 contrast ratio. If you thought that HD TV was the best picture you’re ever going to see, think again. The release of 100/120 Hz Full HD TVs gives you a pretty clear idea that the market is moving again. 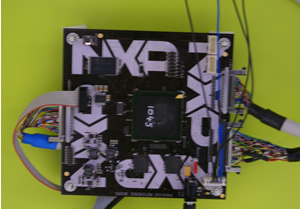 NXP showed us a chip the Nexperia PNX5100 which really ups the game for HD. Lower down you can listen to the interview with those involved and watch a video of it working. 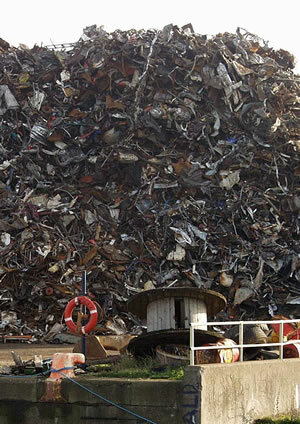 While the UK Government is keen as mustard for the Digital Switchover of TV in the UK, there’s now discussion of the impact that disposing of the analogue kit will bring on – that of further waste generation. The Waste Electrical and Electronic Equipment Directive (WEEE Directive) was under discussion yesterday at Westminster Hall by UK MPs. People still waiting for those wall-sized flat screen TVs that were promised in sci-fi books will be able to take a step closer to their dream with the announcement of Matsushita’s thumping great 103-inch panel TV. Korean electronics company Matsushita, which owns the Panasonic brand, plans to unleash the plasma whopper by the end of the year, and says that it has already taken orders from the US. First demo’d at the Consumer Electronics Show in Las Vegas in January this year, the 2.3 x 1.3m behemoth weighs in at a wall-straining 215kg – making it bigger than a double-sized mattress and almost as heavy as an upright piano. The specifications look sumptuous though, with the 103-inch panel offering a full 1080i HD resolution (1,920 by 1,080 pixels) and an “aaaieee – my eyes!” brightness rating of 3000:1. 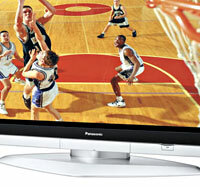 Panasonic reckon that they’ll be able to shift around 5,000 of these enormo-displays in the first year, although they added that probably only 20% of takers will be TV viewers, with the majority buying the display for use as electronic billboards, or displays in studios and corporate lobbies. Smaller than a pack of cards and packed with enough whizz-bang functionality to keep a hyperactive cokehead entertained for hours, MobiBox’s new MP410 multimedia recorder and player packs a big punch for the price. The unit ships with memory capacities running from 128MB to 512MB – not a great deal when you’re dealing with video files, but at least the SD/MMC slot can accept expansion cards up to 4GB. To help keep file sizes down, the MPEG4 recorder comes with a variety of quality settings running from ‘best’ and ‘fine’ right down to the dandruff in a snowstorm ‘economy’ resolution. There’s also a FM radio (87.5MHz~108MHz) with 20 presets with autoscan onboard and the ability to view JPEG pictures. 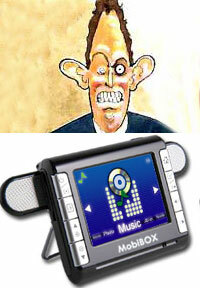 The MP410 also features a pair of folding out speakers for added ‘Tony Blair’ appeal, and comes with a pull-out stand for desk viewing. The MobiBox MP410 is on sale now for around £130 (€188, $237). LG Electronics has rolled up its beefy sleeves, raised its fists and shouted, “Come oooonnn!!!! Let’s be ‘aving you!” to the electronics world, declaring its intent to more than double its share of the world’s top products by 2010. The electronics sharp-shooter currently hogs the highest global market share of items such as domestic aircon units, optical storage, home theatres, DVD players and code division multiple access (CDMA) handsets, but it wants more. Much more. 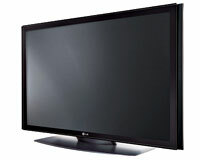 Pointing aggressively, Myung-wo says he wants the global market for plasma display panel (PDP) modules, PDP TVs, liquid crystal display (LCD) TVs, side-by-side refrigerators, built-in air conditioners and drum washers to be pwned by LG. The Korean company has seen a remarkable turnaround of its fortunes over the last decade. Ten years ago, LG was nothing more than a big fish in a small domestic market, managing only a limited global presence. A policy of rapid expansion and smarty-pants innovation resulted in LG grabbing the numero uno slot for optical storage in 1998, a position it continues to hold. Similarly, when it comes to domestic air conditioners, LG rules the roost, and the company is now wrestling for the crown of King of Flat-Panel Displays, knocking out 730,000 plasma units last year to nudge past market leaders Samsung SDI. “We think that our technical edge will help us win out in the global competition in flat panel display and in other fields both locally and globally,” Chun said, pointing out that the company manufacture the world’s biggest TV set and the smallest one. As with all companies at IFA, Grundig have shown a ton of new products, try to persuade the assembled throngs that they are approaching Digital Lifestyles by understanding the consumer. It was all very much of a muchness, until they started talking about 3D TV … everyone in the room lent forward a little. Would this be for real or not. We learnt that it wasn’t the 3D that needed red and green glasses that give you a headache, but was to be viewed with the naked eye. Working with X3D technologies, 3D Image Processing and Cobalt Entertainment (who make the camera), the result are shown on a standard LCD TV Tharus 30 with a special filter, provided by X3D Technologies, fitted to the front. The clever stuff is performed by 3D Image Processing’s (3D-IP) Black Betty box, which generates 8 different views of the 2 pictures recorded by the camera, jiggles them around and displays them in 3D in real time. Back to the demo … Miss IFA (the shows red-haired icon) is called forward to demonstrate. The special 3D camera was unveiled, as were the monitors covered with black-out cloths. Argh … the displays showed fractured moving images striped vertically down the screens. Tech wiz Steve was called forward to carry out emergency turning to the display unit, while the demonstrator started to sweat, explaining that it had worked for the 20 times they had tried it this morning. The black cloths were placed back on the screen to hide the embarrassment. A couple of button presses later and Steve announced it was ready. The room, slightly less believing waited. As the monitors were revealed, the 3D TV was seen and the room was impressed. The ideal viewing distance of 4m was soon compromised as people eagerly clambered over each other to get a view. It’s impressive, with the subject that is nearest to the camera actually appearing forward of the rest of the image in shot. Grundig plan to release the first content on disc – as soon as the cameras have been used to shoot anything. The rumors are George Lucas is already preparing some of Star Wars for 3D broadcast. Oh and if you want to impress your geeky mates, you can call the screen a ‘auto-stereoscopic multi user display’, and that’s official. The BBC has announced that it will be offering classic episodes of “Doctor Who” and “Red Dwarf” on digital video chips for viewing on mobile phones. The company’s commercial arm, BBC Worldwide, has teamed up with mobile phone content firm ROK Player to flog special multimedia memory cards that let users watch feature-length films and programmes on their mobiles. 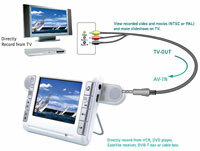 The films are pre-recorded on Sim card-sized DVC (digital video chips) chips which slot into the multi-media memory card of compatible mobile phones. With no content to download via mobile networks, films will automatically load once the card is inserted – and with no requirement for network coverage, commuters will be able to watch Dalek battles while stuck in a train tunnel. Films can be fast forwarded, rewound and paused, just like a conventional movie player. The cards, capable of storing up to two hours of entertainment, will be sold for £17 (US$30, €25), twice the price of a downloaded iTunes album but roughly the same price as the latest DVD releases. ROK Player said they have invested £10 million (US$18m, €14.7m) creating the software which they claim will allow viewers to see high-quality pictures despite the teensy weensy mobile screen size. The first scheduled release is The Five Doctors, a 90-minute Dr Who special originally shown in 1983, followed by three episodes of cult sci-fi hit, Red Dwarf. More programmes are expected to follow from the BBC archive, with the chips initially being sold through Nokia stores, ROK Player’s website and Choices video outlets. 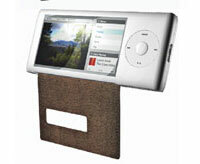 vPod: Apple Closer To iPod Video Player? The rurmour mill continues to hum with speculation that Apple are set to introduce a video playing iPod-like device in the near future. Apple are already said to be talking to major music labels like Warner, EMI, Vivendi, Universal Music and Sony BMG about acquiring licenses to sell music videos through their hugely popular iTubes online store. The Business 2.0 blog reports that Apple is trying to strike similar deals with Disney, ABC News and ESPN. As ever, Apple are keeping Mum on any proposed new hardware, although Steve Jobs has already commented about how the current iPod screen isn’t ideal for watching videos. This has led to speculation that the company will be revising the iPod to create something like the ‘vPod’, a concept device created by design firm Pentagram which was published in Business 2.0 Magazine in March. The magazine’s mocked-up machine looked like a version of the classic white iPod, stretched out to accommodate a wide-format screen. An oversized iPod form would be unlikely to find favour with Jobs as he has already dismissed larger devices such as the Creative Portable Media Center for being too bulky and cumbersome to be a truly convenient portable player. Trouble is, Jobs is well known for trying to confuse competitors with double speak and bluff – he made much the same negative claims about Flash-based music players before releasing the Shuffle. For many, the smart money is on Apple leaving the iPod as it is and introducing a completely different video player that will aim to grab the public’s imagination in the same manner as the iPod captured the music download market by the MP3s. The big problem with trying to create a multimedia device is that people demand quite different things for mobile audio and video. Music listeners want a small device that can fit into their sweaty jogging pants, while video buffs want a big wide screen for their moves that won’t be obscured by a few flakes of popcorn.